From farmer and beekeeper Grandpa Romolo and Grandma Assunta, insuperable whiz in our garden of trees, flowers and organic vegetables, and baker of delicious cakes and biscuits, and on to Riccardo, the "little one" of the house. In the middle are Chiara and Valerio, a banker and a consultant, with their quintessential delight in making someone's day that little bit better through their hospitality. Our house is old and charming, just away from the river Po and nestled in the Mantova countryside. We made up our minds to restore some of the rooms and finally make our dream come true: a Bed & Breakfast that was completely our own. Our roots are here. And we will look after you. Along with rooms decorated with an eye for detail and warmth, the flavour of our generous homemade breakfast, our natural honey, and the unspoiled peace of our countryside. 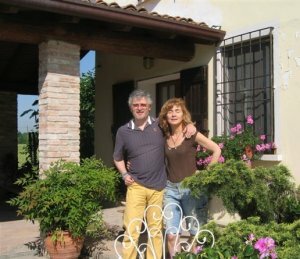 It is an ideal Bed & Breakfast for visiting superb Mantova, enjoying that perfectly relaxing weekend, or simply slowing down in the rhythm of a natural environment which you just feel has been forgotten. Taste and listen, visit and walk, sleep and awaken. At the beginning was the word of a lovely trip to Mantova, and the word was an enjoyable stay at l’Alveare. In the vicinity of Mantova (Mantua), 17 km distance, a city of arts and a cradle of the aristocratic Gonzaga family. Small and pleasant, it is a Renaissance gem resplendent in monuments and palaces designed by many famous architects, including Giulio Romano, and rich in art with masterpieces by painters such as Mantegna. Besides its wealth of art and culture, visitors are regularly and pleasantly surprised at Mantova's relaxing atmosphere and excellent authentic cuisine. This can be tasted in the city's numerous small restaurants and cafés where typical local dishes are readily available. Within walking distance to the river Po, the Oglio Sud Park begins with the WWF oasis "Le Bine". Not far away is Parco del Mincio, where boats can be hired to explore this distinctive environment. Within a 25 kilometre-range you can visit the town small Sabbioneta, a perfect example of the Renaissance, also the Abbey San Benedetto Po in Polirone, a very important reference point in the Medieval era (under the Abbey Cluny in France), which later came into the possession of Matilde of Canossa, sometimes called la Gran Contessa ("the Great Countess"). Of further note are also the Pontoon Bridge and the Castiglioni Court in Torre d'Oglio. The Castiglioni Court was the residence of Baldassarre Castiglioni, who in the 16th century wrote the first book of etiquette "Il Cortegiano". Also of interest is the Austrian Fort in Borgoforte. On the other side of the Po there is a belt of unique characteristic small towns and villages: Luzzara where the famous Italian screenwriter Cesare Zavattini was born, with its Naive Art Museum; Guastalla, city of Duke Ferrante Gonzaga; Gualtieri with its marvellous Piazza Bentivoglio and the Museum dedicated to the works of Antonio Ligabue, one of the most renowned naïve painters in the 20th century; and last but not least Brescello, home of Don Camillo e Peppone, with their Museum. Membri dell' Associazione "Mantova Bed and Breakfast" sinonimo di qualità. Segnalati dalla guida 2007 Bed & Breakfast del Touring Club.